National Safe Digging Month serves as a reminder to all people who excavate or dig to call 811, at least 72 hours before digging, to have the approximate location of their utility lines marked. This process helps prevent injuries, property damage, and inconvenient utility outages. The Common Ground Alliance is a member-driven association with approximately 1,400 members representing utility and energy companies, professional excavators, emergency-response agencies, and railroads. The CGA is committed to raising the public’s awareness of underground safety. Through various programs, such as National Safe Digging Month, the CGA’s primary goal is to reduce damages and near misses to the underground infrastructure of pipelines, conduits, wires, and cables. Designating April as National Safe Digging Month is just one way to raise awareness. The 811 public awareness campaign was launched on May 1, 2007, by the CGA to the nation. In a recent survey, approximately four in 10 homeowners plan to dig on their property this year for an outdoor home or property improvement project. Of those homeowners who plan to dig this year, nearly half (45 percent) will not contact their local one-call utility notification center by making a free call to 811 to learn the approximate location of underground utility lines, putting their safety and the safety of their community at risk. Two-thirds of homeowners believe they would not hit an unmarked underground utility line and cause a service outage at their own home or a neighbor’s home, despite the fact that an underground line is damaged every three minutes nationwide, according to Common Ground Alliance data. Male homeowners are more likely than their female counterparts to believe that no negative consequences would come from digging on their property without knowing the approximate location of nearby underground utility lines, and 49 percent of male homeowners thought they would not hit an unmarked line while digging, compared to 38 percent of female homeowners. 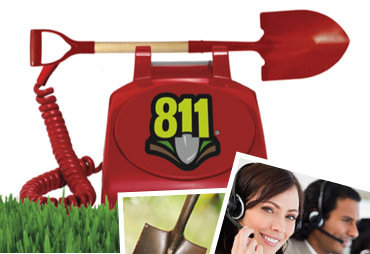 If you would like to know more about 811 or CGA, visit www.call811.com or www.commongroundalliance.com .